wait. how are we already a month into summer?!? and why is that winter drags on for eons and summer blinks by?! ugh. ok, so back to it. 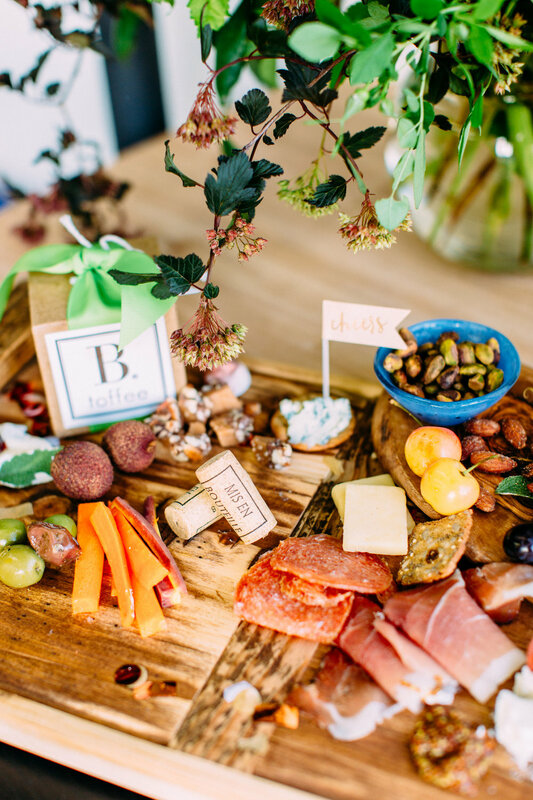 a month ago, i hosted a styled cocktail & charcuterie class with my friend lish and betsy, the owner of b. toffee. and if you haven't tried b. toffee, get some. they sell it in west coast whole foods & soon to be williams sonoma all over the usa. my mother who proudly proclaims that she doesn't care for toffee GOBBLES this stuff up. anywho. we hosted a styling class focused on some light summer cocktails and building the perfect meat & cheese board for your summer gathering. we had a BLAST and at the end of the night we were buzzing. not because of the booze, but because it was intoxicating getting together with other talented and creative women to laugh, drink and celebrate the season. below are some snaps from the amazing ashley paige who captured the evening. the stunning flowers were provided by french buckets and the cute drink menu cards were made by killer paper goods artist (and former coworker from my roxy days) darla marie designs. most importantly, below is the recipe strawberry + rosé spritz we sipped and styled. ingredients: 3 oz rosé. 2 oz aperol. 2 oz club soda. 1 oz fresh lime juice. 2 strawberries, hulled and sliced. 1 cup ice. glass for serving. lime wedge for garnish. fill your serving glass with ice. add in all but one of your strawberry slices.pour in the rosé and aperol. add in the lime juice. top off the drink with club soda. give everything a quick stir to combine. garish with lime wedge and the last strawberry slice. fill your serving glass with ice. add in all but one of your strawberry slices. pour in the rosé and aperol. add in the lime juice. top off the drink with club soda. give everything a quick stir to combine. garish with lime wedge and the last strawberry slice. serve and enjoy.